When Mephibosheth was ﬁve years old, his father, Jonathan and grandfather, Saul the king of Israel, were killed in a battle with the Philistines. Word of their deaths reached the nurse who was caring for him and she panicked. She took him in her arms to ﬂee but dropped him on her way out and somehow crushed his feet. As a result, he would live out the rest of his days lame in both feet. In 2 Samuel 9 we ﬁnd Mephibosheth all grown up, living in somebody else’s house in a little village called Lo Debar. The Hebrew for Lo Debar means “no pasture”. That kind of says it all for Mephibosheth. He was living out his days in obscurity, maybe even in hiding as it was not uncommon for a new king to kill oﬀ any heirs of the deposed king to eliminate any claims to the throne. There are pockets of broken, hurting, marginalized people in every city across our nation. They are often ignored and overlooked or worse, despised and abused. Some are there due to their own decisions and mistakes, others, like Mephibosheth, have been dropped by another person who was supposed to take care of them. Whatever the circumstances, they now pass their days in a state of hopelessness, unable to believe that their lives could ever be diﬀerent. The picture here is powerful. There is a King, his name is Jesus. He sees and cares about the broken and He calls us, His followers, to go to “Lo Debar”. 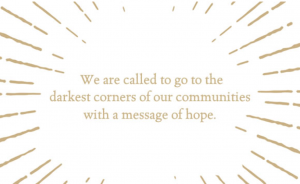 He calls us to go to the darkest corners of our communities with a message of hope. The King invites “whosoever will” into His Kingdom, not as peasants to be exploited but as children to be adopted and given a seat at the table. David didn’t just send Mephibosheth a gift basket, he gave him a seat at his own table. There’s a diﬀerence between making periodic excursions into brokenness and embedding yourself into the lives of broken people. Real, raw relationships are the greatest conduit for the gospel. Unfortunately, our tendency as Christians is to surround ourselves with people just like us; people who think, believe, look and act just like we do. If we ever really hope to penetrate the darkness in our communities and oﬀer hope to people who have all but given up, we will have to forsake safe, comfortable religion for the risky, messy adventure of following Jesus. And following Jesus will always lead to broken people. It is amazing what can happen when we take the time to really listen to someone’s story without agenda. Judgment and criticism can melt into compassion and empathy. A person’s story is sacred space and, when we treat it as such, we demonstrate that we love and value that person. Everyone has a story. And that story has shaped them for better or for worse. When we really learn to listen, we begin to realize that life is complicated and sometimes more gray than black and white. Most people aren’t looking for you to ﬁx them, they just want to know that you love them baggage and all. Real, raw relationships that lead to transformation are hard work. They take time and eﬀort. Sometimes they can be frustrating and sometimes they can be heartbreaking. People who have lost hope have also usually lost a lot of relationships. Sometimes it’s because they’ve sabotaged them. Sometimes it’s because the relationships had conditions they couldn’t live up to. Whatever the case, consistent loving relationships are the best context for new beginnings to happen. That means showing up for the celebration of a sobriety chip AND showing up in the chaos of relapse. Encourage your congregation to read the book. It is ﬁlled with stories of hope! Read the appendix at the end of the book speciﬁcally for pastors and leaders. Preach a sermon series on the book or read it with your small group. Sermon outlines as well as small group discussion questions and videos are available by clicking here. Have your church go through the small group study that goes with the book. Access small group videos and questions at the above link.